PR: Wow, okay. Well I think the angle to take into that… It took a while for, not just other people but for me to, get to grips with how I thought the plays should be done. Because you learn by creating something, and it was sometimes from seeing the productions that weren’t working, and me thinking now “why isn’t that working”, that I had to go away and work out what needed to be done. Sometimes in terms of the writing, but sometimes in terms of the world, because no one had seen, if you like, that world before. I hadn’t seen that world before. So how to translate that onto the stage, if you like, was something different. And you learn how to do that, you learn that, like with anything creative, it’s never one big decision, on anything. No work of art is one big decision. It’s ten thousand tiny decisions that build up to a statement at the end. And I had to get a lot of the individual things done. Part of that is choice of actors, that I realised that some actors can engage with the world and do it, that they have a connection with it, and some actors don’t – it doesn’t mean they’re lesser actors or whatever, it just means that some can and some can’t. 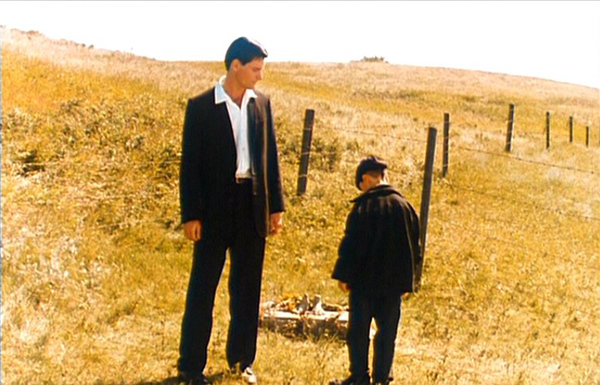 Viggo Mortensen in the 1990 Ridley-directed film The Reflecting Skin. It’s why we rarely get very good productions of Tennessee Williams in England, because we haven’t got the Marlon Brandos or all of that. That’s not the kind of actors that we produce. So there’s a very particular kind of actor actor that can do the work, and it took a while to kind of work that out. The big overall thing that people got wrong, for a long time, was that they treated the work like fantasy. I’ve seen many productions that I’ve gone along to and it’s like looking at a Tim Burton film, and “oooh, that’s er.. interesting” but not what it should be. That they didn’t see that the plays were realist, they’re real plays, for me they’re a very true world. And I’ve seen lots of things where there are wonky houses, populated by people with white make-up on and black eyes, and I still see things like that. But it’s not what the work’s about. But gradually that’s going away, and people are discovering, I think, a much better way to do it. But yeah, I’ve gone into productions, particularly foreign productions, where you think you’ve wandered into the wrong theatre. HB: [laughing] Of course. But I wonder if there’s something about legacy in that. Are you worried that when you’re, God forbid dead and gone, that your work could be taken in a myriad of ways? PR: No that scares me to death. That scares me to death. I’m much less of a control freak than I used to be; I used to be unbearable. I think back to some of the earlier people that worked with me and I still blush, at how interefering I was. My defence of that was that coming out of artschool I was used to doing everything: I had my own theatre company, I wrote the plays, I directed them, I wrote the music, did the costumes, did the lighting. And for five years I’d done that. So that when I came out I didn’t realise that I wasn’t supposed to. That’s what I do, I tell everyone how to do it. And it took me years to back away and just let people get on with it. It does scare me what goes on elsewhere. I sometimes get photographs through of productions happening in Brazil and you kind of think “Whoer!” Please tell me that’s not happening. Nothing you can do really.